The Marca Hispanica (Spanish : Marca Hispánica, Catalan : Marca Hispànica, Aragonese and Occitan : Marca Hispanica, Basque : Hispaniako Marka, French : Marche d'Espagne), also known as the March of Barcelona[ citation needed ], was a military buffer zone beyond the former province of Septimania, created by Charlemagne in 795 as a defensive barrier between the Umayyad Moors of Al-Andalus and the Frankish Carolingian Empire (Duchy of Gascony, the Duchy of Aquitaine and Carolingian Septimania). Aragonese is a Romance language spoken in several dialects by 10,000 to 30,000 people in the Pyrenees valleys of Aragon, Spain, primarily in the comarcas of Somontano de Barbastro, Jacetania, Alto Gállego, Sobrarbe, and Ribagorza/Ribagorça. It is the only modern language which survived from medieval Navarro-Aragonese in a form distinctly different from Spanish. The area broadly corresponds to eastern regions between the Pyrenees and the Ebro River. The local population of the March was diverse. It included Basques in its north-western valleys, Jews  , and a large Occitano-Romance-speaking Iberian population practising Visigothic traditions and law (Occitans and Catalans), all of them under the influence of Al-Andalus culture, since their lords had vowed allegiance to Cordovan rulers until Pepin's conquest of Andalusian Septimania (759). The Pyrenean valleys started to switch loyalties after 785 (Girona, Ribagorza, etc.) with the construction and garrisoning by counts loyal to the Carolingians of new outposts and fortresses on bordering areas. Wāli or vali is an administrative title that was used during the Caliphate and Ottoman Empire to designate governors of administrative divisions. It is still in use in some countries influenced by Arab or Muslim culture. The division that a Wāli governs is called Wilayah, or, in the case of Ottoman Turkey, "Vilayet". The County of Pallars or Pallás was a de facto independent petty state, nominally within the Carolingian Empire and then West Francia during the ninth and tenth centuries, perhaps one of the Catalan counties, originally part of the Marca Hispanica in the ninth century. It was coterminous with the upper Noguera Pallaresa valley from the crest of the Pyrenees to the village of Tremp, comprising the Vall d'Àneu, Vall de Cardós, Vall Ferrera, the right bank of the Noguera Ribagorçana, and the valley of the Flamicell. It roughly corresponded with the historic region of Catalonia called Pallars. Its chief city was Sort. Modern-day Urgell, also known as Baix Urgell, is a comarca (county) in Catalonia, Spain, forming only a borderland portion of the region historically known as Urgell, one of the Catalan counties. Cerdanya or often La Cerdanya, is a natural comarca and historical region of the eastern Pyrenees divided between France and Spain. Historically it was one of the counties of Catalonia. The rulers were called counts; when they governed several counties they often took the name duke (Dux Gothiae). When the county formed the border with the Muslim Kingdom, the Frankish title marquis (Marquis de Gothie) was chosen. Besides, certain counts aspired to the Frankish title "Prince of Gothia". A margrave or Marcgravi is a Graf ("duke") of the March. The first Toulousains and Catalan lords who held the title of Counts of Barcelona, Bernard of Septimania, Humfrid, Bernard of Gothia, Borrell II and Ramon Borrell carried these titles. However poor communications and a distant central power allowed basic feudal entities to develop often self-sufficient and heavily agrarian. Each was ruled by a small hereditary military elite. These developments in the territories that later would become Catalonia followed similar patterns in other borderlands and Marches. For example, the first Count of Barcelona Bera was appointed by the King in 801, however subsequently strong heirs of Counts were able to inherit the title such as Sunifred, fl. 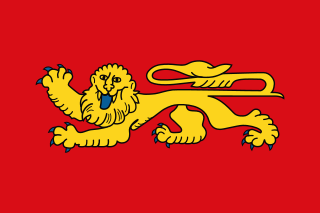 844–848. This gradually became custom until Countship became hereditary (for Wifred the Hairy in 897). The County became de facto independent under count Borrell II, when he ceased to request royal charters after the kings Lothair and Hugh Capet failed to assist him in the defense of the County against Muslim leader al-Mansur,  although the change of dynasty may have played a part in that decision. The County of Roussillon was one of the Catalan counties in the Marca Hispanica during the Middle Ages. The rulers of the county were the Counts of Roussillon, whose interests lay both north and south of the Pyrenees. 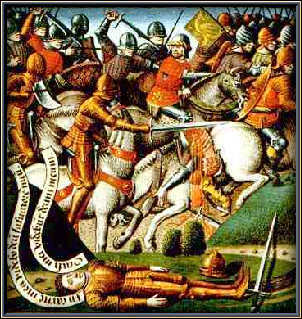 Humfrid was the Count of Barcelona, Girona, Empúries, Roussillon, and Narbonne from 858 to 864. He also bore the title Margrave of Gothia, as he held several frontier counties. The Catalan counties were the administrative Christian divisions of the eastern Carolingian Marca Hispanica and southernmost part of the March of Gothia in the Pyrenees created after its Frankish quick counter conquest. Wilfred or Wifred, called the Hairy, was Count of Urgell, Cerdanya, Barcelona, Girona, Besalú and Ausona. On his death in 897, his son, Wilfred Borrell, inherited these Catalan counties. The Battle of Roncevaux Pass was a battle in which a combined Basque-Qasawi Muslim army defeated a Carolingian military expedition in 824. The battle took place only 46 years after the first Battle of Roncevaux Pass (778) in a confrontation showing similar features: a Basque force engaging from the mountains a northbound expedition led by the Franks, and the same geographical setting. ↑ On the Role of the Jews in the Establishment of the Spanish March (768-814) : STUDIES IN THE HISTORY, LANGUAGE AND LITERATURE OF. / Bachrach, Bernard S.
↑ Chandler, Cullen J. (2002). "Between Court and Counts: Carolingian Catalonia and the aprisio grant, 778-987". Early Medieval Europe. 11: 19–44. doi:10.1111/1468-0254.00099. ↑ Reuter, Timothy; MacKitterick, Rosamond, eds. (1995). The New Cambridge Medieval History III: c. 900 – c. 1024. Cambridge University Press. pp. 390–391. ISBN 978-0-521-36447-8.